The TTCS OSSWIN v2.30, a collection of the latest version of Free and Open Source Software for Microsoft Windows 10/8/7 is available for download. Visit the TTCS OSSWIN page at https://www.ttcs.tt/osswin for more details and to download the 4GB collection as an ISO file for extracting to your harddrive or USB storage device or for burning on to a DVD. 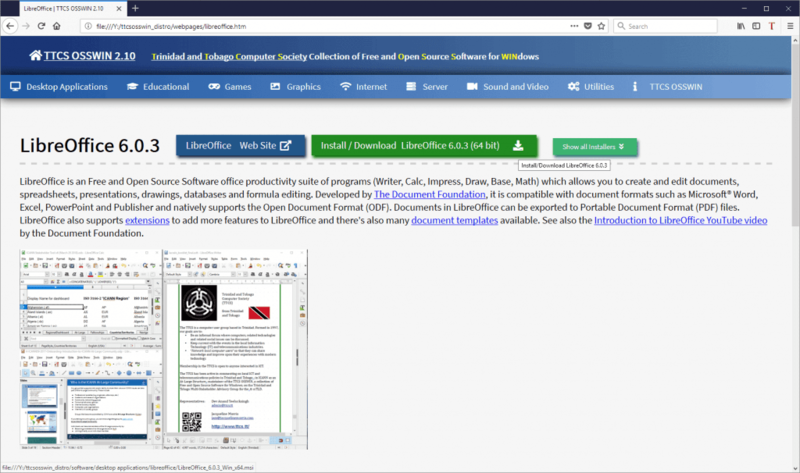 Note that you can also browse TTCS OSSWIN online at http://ttcsosswin.ttcs.tt/ which features the web interface to learn about Free and Open Source programs in various categories, including screenshots or videos of the programs and a link to the program’s website where you can download the program. The web based UI is responsive, meaning it should be usable on non-Windows small screen mobile phones and tablets. The Trinidad and Tobago Computer Society has submitted its comments on the Telecommunications Authority of Trinidad and Tobago (TATT) “Discussion Paper on Android Boxes in Trinidad and Tobago” (PDF ; 666K ; 22 pages). 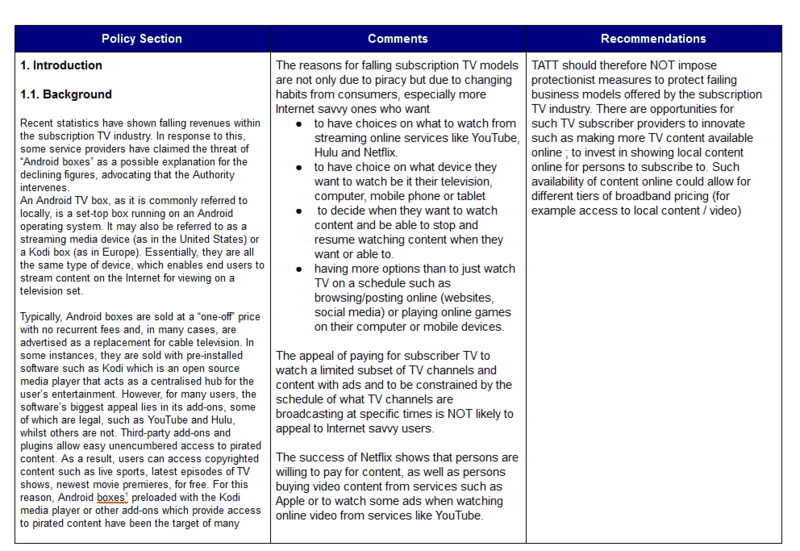 Please review the TTCS comments on TATT’s discussion paper on Android boxes. You do not need a Google account to comment. – to have choices on what to watch from online services like YouTube and Netflix. – to decide when they want to watch content and be able to pause and resume watching content when they want. The appeal of paying for subscriber TV to watch a subset of TV channels with ads and to be constrained by the schedule of what TV channels are broadcasting at specific times isn’t likely to appeal to Internet savvy users. The success of Netflix shows that persons are willing to pay for content, as well as persons buying video content from services like Apple or watch ads when watching online video from services like YouTube. The proliferation of cinema megacomplexes in Trinidad and Tobago also point to persons that are willing to pay to watch the latest movie releases. Please view and comment on the draft TTCS comments on TATT’s Discussion Paper on Android Boxes in Trinidad and Tobago. You do not need a Google account to comment. TATT’s deadline for comments on the discussion paper is Friday August 24 2018.
i. explore the nature of OTT services as they relate to voice, media and messaging. ii. present the key principles underlying both sides of the net neutrality debate. iii. examine the policy issues relating to net neutrality and OTT services. iv. propose guiding principles for net neutrality in Trinidad and Tobago. 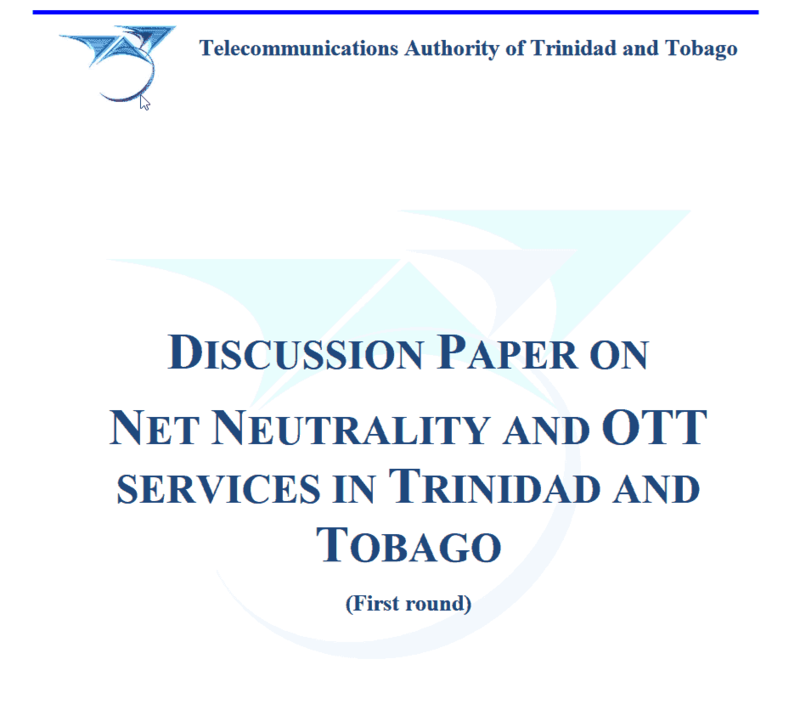 v. make recommendations for the regulation of net neutrality and OTTs in Trinidad and Tobago. Interested persons are asked to submit comments on this document in accordance with the TATT’s Public Consultation Comment Submission Form on or before Friday 7 September 2018. The Trinidad and Tobago Multistakeholder Advisory Group (TTMAG) will be hosting a Internet Governance 101 event on July 21 2018 from 9am to 11:30am at Naparima College, San Fernando, from 9 a.m. to 11:30 a.m. The event is free, however space is limited. To confirm your attendance, visit the TTMAG IG101 Eventbrite page to register online. Persons that register will be sent preparatory material for the IG101 event. Trinidad and Tobago Computer Society Lime [Discussion paper on Android boxes] on **Wednesday ** July 4 2018 from 7 to 9:30 pm; please RSVP! The Trinidad and Tobago Computer Socierty will be having a lime on Wednesday July 4th 2018 from 7pm to 9:30 pm at Wendy’s Cafe located upstairs at Wendy’s Restaurant at the corner of Ana Street & Ariapita Avenue, Woodbrook, Port of Spain. Our key topic for this lime is to discuss TATT’s “Discussion Paper on Android Boxes in Trinidad and Tobago” (PDF ; 666K ; 22 pages) and to help formulate our response (Google doc, no account required) to TATT as a group. Please come prepared with your comments and contributions to the discussion. Anyone interested in computing and ICT are welcome to attend, however please RSVP to [email protected] . See you there! (Update August 16 2018 – TATT has extended the deadline for comments to Friday 24th August, 2018. Do comment on the TTCS draft comments on TATT’s discussion paper on Android Boxes in Trinidad and Tobago. The Telecommunications Authority of Trinidad and Tobago (TATT) has released the discussion paper “Discussion Paper on Android Boxes in Trinidad and Tobago” (PDF ; 666K ; 22 pages) on June 25 2018. 1. Introduce the concept of Android boxes, and their nature and prevalence within the Trinidad and Tobago market. 2. Assess the impact of Android boxes in Trinidad and Tobago from the service provider’s perspective. 3. Assess the impact of Android boxes in Trinidad and Tobago from the consumer’s perspective. 4. Present other countries’ approaches to the issue, especially with respect to its legality. 5. Identify the legislative remit of the Authority in addressing any issues related to Android boxes. 6. Present possible solutions and recommendations that may be undertaken by the Authority. View / Download Discussion Paper on Android Boxes in Trinidad and Tobago” (PDF ; 666K ; 22 pages). 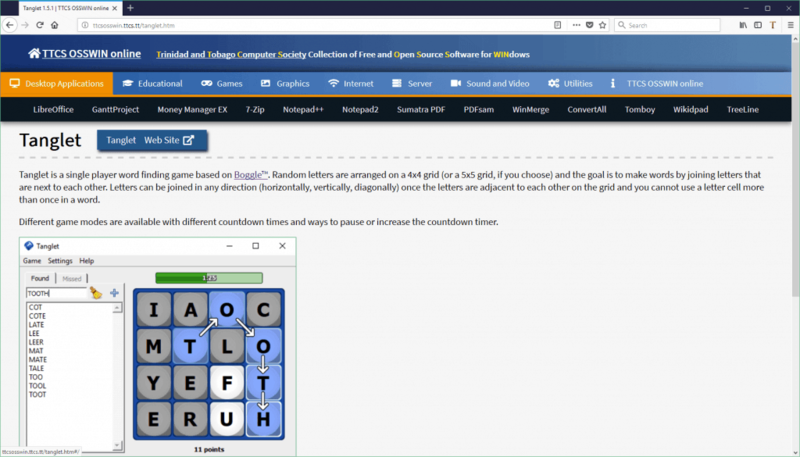 Following the updates to TTCS OSSWIN online, the TTCS OSSWIN v2.20, a collection of the latest version of Free and Open Source Software for Microsoft Windows 10/8/7 is available for download. TTCS OSSWIN online (http://ttcsosswin.ttcs.tt/) is a online resource of Free and Open Source Software for Windows 7/8/10 put together by the Trinidad and Tobago Computer Society for any Windows user to discover software organised in various categories that can be downloaded and installed. Each program has a description along with screenshots and / or videos of the program in action. Updated : replaced over a dozen screenshots of programs running in Windows XP with screenshots of those programs running in Windows 10 ; added videos for mDesktop and Really Slick Screensavers.